To benchmark the code with and without JIT I used Takashi’s own gem benchmark_driver. The README will guide you on how to create a simple YAML file. Since I don’t use rbenv as Takshi, but ruby-install and chruby, I just pass the executables with -e option (I even sent a patch some time ago for this option since I didn’t realize it’s there!). I sent a patch to fix the README. In this blog post I am benchmarking the generation of a simple invoice using InvoicePrinter’s render method. It’s variant on this example. InvoicePrinter is based on Prawn PDF library. I am running the benchmark on my Thinkpad X1 Carbon 5th generation with i7-7600U processor, 16 GB RAM and SSD. I already committed this benchmark to the InvoicePrinter repository, feel free to suggest improvements! Depending on a run Ruby 2.6 can render here around 100 invoices per second. 4-5 more or less than 2.5. In other words it seems the performance is pretty much the same. The –jit version runs 1,1-1,6 times slower which is not yet great. 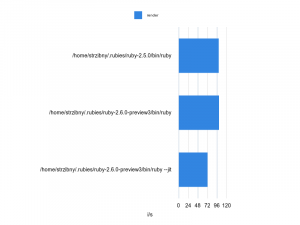 Ruby 2.6 uses a little more memory than 2.5 on my example. The –jit version even 4 times as Ruby 2.5. Feel free to run it yourself and report. I hope this benchmark can help Takashi somehow and we see some improvements for JIT when using Prawn in future. I think significant improvements will come in 2019; xmas release is too early to make the JIT superfast. Thanks for the benchmark. 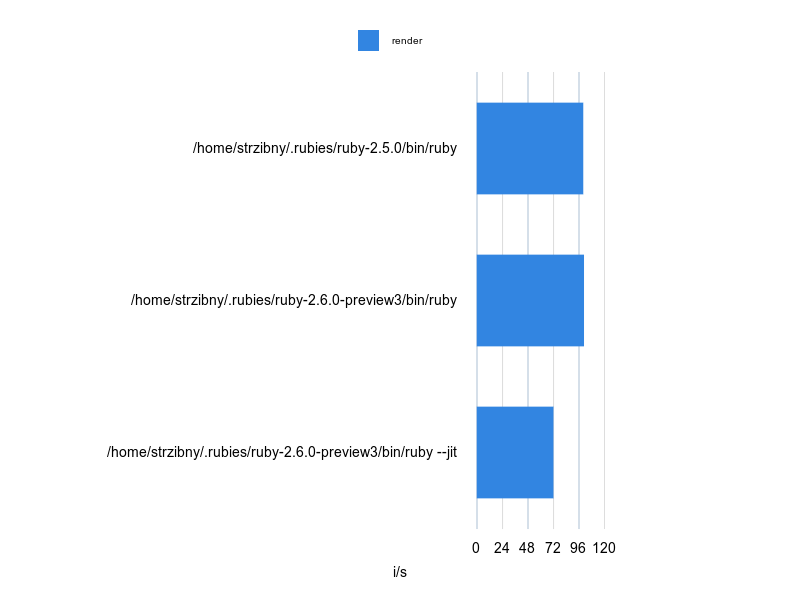 While I look forward to upgrading ruby to use JIT, doesn’t appear we are quite yet. Guess I will continue to stay on 2.5 for the time being. Do you plan to benchmark any other tasks? I might, but perhaps I wait for the final version.